Ilorin was agog last Friday when some of the country’s best performers invaded the city in a musical concert put together by telecom giants, MTN, to celebrate the company’s 10 years of providing social services to the nation. As early as 4pm, many had queued up at the Roemichs Hall, the venue of the show. And as the hall vibrated with all the razzmatazz of such shows, a DJ was stationed outside the hall to dish out different songs to the excited waiting on the queue. On the dot of 5.44 pm, the DJ kicked off the show by dishing out songs that kept the crowd yearning for more. It was fun all the way. A few hours later, the two comperes for the night Seyi Law and Jedi came on board with rib cracking jokes that wetted the crowd’s appetite while the stage was getting set for the key actors of the night. As the count down began, the first of performers- up and coming musicians took their turns to the delight of the crowd. After their performances comedian Seyi Law returned to do what he knows best how to do, entertain with jokes. Soon it was the turn of the MTN project fame products, Yetunde Omo Ibadan, Chidinma, Iyanya, to perform. They didn’t disappoint. The big performers, Sir Shina Peter, Adewale Ayuba, Kenny St Brown, Olamide and Abolore Akande alias 9ice raised the bar till late in the night. The Concert train moved to the Federal Capital territory, Abuja the next day. And for more than six hours, Abuja was held spellbound on Sunday by the star studded concert. Sir Shina Peters, 9ice and Wizkid were the lead actors in the show that dazzled the audience. Dr. Sid, Prince, Mike, Iyanya Chidinma, and Ikechukwu were also on hand to lend support as the crowd couldn’t but ask for more. The duo of Seyi Law and Jedi spiced the evening with rib-cracking jokes to the delight of the crowd which responded with great applause. Since the surprising performance between the Koko master Dbanj and Ikechukwu Onunaku at the Sprite triple jam held in August this year; which saw both artistes dolling out lyrics from Ikechukwu’s hit tracks Critical and Wine am well, entertainment journalists had concluded that whatever had made the Now is the time crooner walk out of the Mo’Hits family in 2010 may have been finally forgiven and forgotten. There had been speculations from fans and critics alike that their once robust business and personal relationship will speedily be rekindled. But then, things may just not be the way they appear. Recently, this reporter ran into the rap artiste aboard a cruise boat in the Lekki peninsula in Lagos where he confirmed that his relationship with the Mo’Hits family was fine and without hassles. Then the questions came and the once chatty interview turned completely around. This reporter asked if the Mo’Hits crew will be having any spot in this new album of his. Will there be collaborations? And if Don Jazzy will be producing any or all of his beats just like things had been in the past between him and the crew? He would answer no more questions. Maybe it’s because of his strong training in shotokan karate, aikido, taekwondo and even tai chi but then, this reporter had not pursued the matter any further. Ikechukwu had hit fame land with his debut single My name is before going on to rock parties with Wine am well; a track that had strong collaborations with Dbanj and the beat master himself Michael Collins Ajereh aka Don Jazzy. According to tale bearers, the rumoured fight had been the reason for his exit from the Mo’Hits family. It is also one rumour that many now know was a figment of someone’s imagination. But then, what really made Ikechukwu walk out in the first place? And with this temper… has he truly, truly reconciled with the Mo’Hits? The last time Annie Macaulay talked about her relationship with 2Face Idibia her ex-beau and father to her daughter, it was on a note of finality. “We have our lives to live. I don’t care what he does with his life”, she’d gushed to Weekend Groove. But all that bravado may have been doused by her recent outburst on the wall of social network twitter where she poured venom on her former friend, one Dr. Ojia. Ojia, an Abuja based medical practitioner is reported to be the hottest item on 2Face’s menu list and our source say, this development has not gone down well with Annie who felt betrayed by her bosom friend. ‘Worst human I ve ever met…..Ojia! I don’t talk behind people’s backz.. I say it as it is! Beware people, of the very confused Doctor!! DEVIL in disguise‘. Ojie who’s name has been associated with many prominent names in the entertainment industry is said to have also dated former West African Idol winner Timi Dakolo. 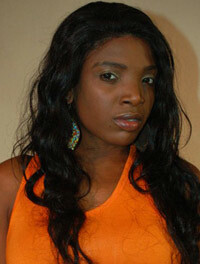 She is allegedly involved in a sizzling affair with the Benue State born super star musician.